Ricoh Caplio Pro G3 is launched by Ricoh. The Ricoh Caplio G3 is a high-resolution digital camera that embeds captured images with GPS coordinate information received from either its on-board GPS unit or from external GPS devices. Once these captured 'geo-images' are transferred to a PC, they are automatically converted to shape files or merged to geo-databases for instant integration into Geographic Information Systems (GIS). Points representing each image's position may be hovered over to display a thumbnail, or clicked on to access the full-size image. In addition to storing GPS data in the image, the camera also utilizes a user-configurable data dictionary for tagging pictures with workflow-related information. These attributes are easily accessible from the GIS layer table for automated database integration. "The Ricoh Caplio Pro G3 is designed to provide GIS users with a simple and seamless method to integrate images into mapping applications," said Jeff Lengyel, Marketing Manager of Ricoh's Digital Camera Division. "Until now, there has been no single-unit solution to address the imaging needs of the GIS community". The ruggedized Ricoh Caplio Pro G3 digital camera uses a CompactFlash slot to accept WAAS-enabled GPS cards. For applications that require even greater precision, the camera is capable of receiving NMEA data streams from external GPS devices via BlueTooth. "Successes with early adopters of the Ricoh Caplio G3 signify it is fast becoming the defacto-standard for image-based GIS workflows," Lengyel said. "We needed a way to identify and photograph more than 30,000 street lights," says A.J. Romanelli of EMA, Inc., a workflow optimization company. "After researching all available options, the Pro G3 stood out as the optimal device for our application. The camera did exactly what we needed it to do and allowed us to finish the project ahead of schedule and without errors." FEMA has adopted the Ricoh Caplio Pro G3 to photograph storm damage in the southeast United States, while archeologists in Maine use it to scout out dig sites; the camera is being used to track hiking trail conditions; the U.S. military is using the camera in Iraq; universities, advertising agencies, insurance agents, realtors, government agencies, engineers, National Park personnel, farmers, and even museums are finding that their GIS workflows have been optimized since adopting the Ricoh Caplio Pro G3 digital camera. 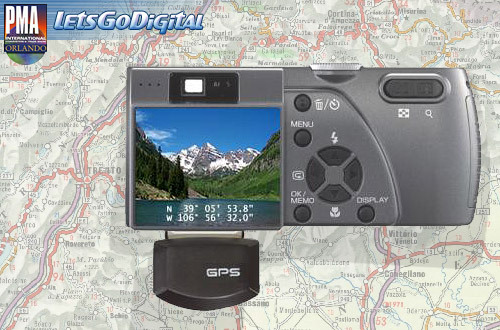 The Ricoh Caplio G3 GPS-ready digital camera features a 3.34 Mega-pixel sensor, a 3X optical zoom with the ability to mount accessory lenses, video and sound capture capabilities, and direct connectivity into IP networks via wired or wireless LAN. 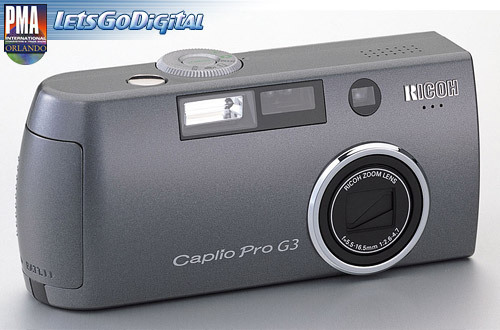 The Ricoh Caplio Pro G3 is available now from authorized Ricoh resellers.